The masterminds behind the Americana Folk Festival have conceived a truly utopian, nostalgic vision. Gather a group of quality artists—many of them singer-songwriters, but not all necessarily working within the folk idiom—on a spacious, wooded plot of land deep inside Montgomery Bell State Park, about an hour outside of Nashville. Encourage communal picking parties by providing the artists with lodging for an entire weekend. Make the experience even more earthy and tactile by creating an Arts Village alcove for artisans to display their handmade wares. Then invite fans of well-crafted songs to stake out a spot on the grass and plant their lawn chairs for the duration. The bill was populated by a rich assortment of artists. Seven-piece string-and-horns band, Ballhog!, parlayed its unorthodox instrumentation (upright bass, drums, mandolin, acoustic guitar, banjo, flute and an assortment of saxophones) into raucous, bar-ready fare. Sandra McCracken, accompanied by husband, Derek Webb, worked her way through several songs from her latest album, Gravity Love. Her supple, feminine soprano—complimented by Webb’s earnest vocals and crisp guitar work—enlivened the rich, down-to-earth spirituality of “Long Way Home,” “Shelter” and the Wendell Berry-inspired “Broken Cup.” Splitting his half-hour set between grand piano and baritone ukulele, David Mead delivered exquisite, British-influenced pop, often stretching his suave vocals into a falsetto. Blue Mother Tupelo is quite possibly the best husband and wife duo you’ve never heard of. Micol and Ricky Davis, and whomever happens to be their drummer at any given time, play swampy, gospel-tinged southern soul-blues. Micol displayed the full-bodied vocal fire of Janis Joplin, while she rattled and slapped her tambourine with the ecstasy and know-how of a black gospel choir member. Ricky played muscular, stabbing figures on acoustic guitar and dobro, and the two joined in close, soul-searing harmonies like only intimate kin can. When the couple sang an A capella rendition of the old gospel number “Wish I Was in Heaven Sitting Down,” the result was a heady blend of otherworldly longing and thisworldly passion, bodies swaying and tambourines shaken emphatically. Old Black Kettle featured not just one, but two prodigiously talented roots songwriters. 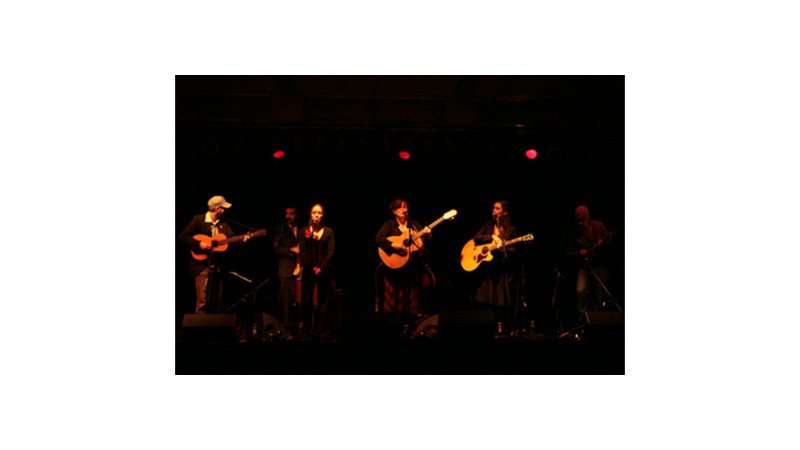 Julie Lee and Sarah Siskind mined each of their old-time, bluegrass-leaning repertoires, backed by an able four-piece band. Lee’s sweet, brassy lilt and Siskind’s nimble soprano animated the elegant, deeply felt songs. But the real highlights came when the two joined with backing vocalist Jodi Haynes in keening, angelic three-part harmony. Patty Griffin was the evening’s main attraction. She took the stage accompanied only by lead guitar player Doug Lancio, and launched into the riveting acoustic soul of “Let Him Fly.” With spare arrangements and the unforced vocal sensuality, she reprised old favorites like “When It Don’t Come Easy,” “Chief” and “Forgiveness,” and debuted a handful of new songs from her upcoming album, teasing that the audience would have to wait a few months to hear the rest. Even as the temperature plunged, the sea of people clad in blankets, coats and stocking caps remained engrossed in Griffin’s nuanced folk storytelling. All told, the Yazoo beer flowed (Yazoo is a top-notch, Nashville-based micro-brewery), the overall ethos was one of generally harmonious community and the art of good songwriting received due honor. Not bad for a Saturday in the park.